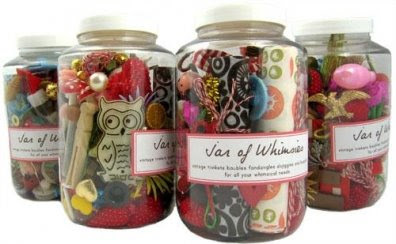 .... than a 'jar of whimsies'? This is so charming it makes me want to be both a kid and a grandmother at the same time. Not a bad idea for storing all those little teeny tiny things that you want to keep, but have no specific use for. (think: friendship bracelets from grade six, old bike lock keys, or that piece of mystery plastic that you just know is important but have no idea where it came from).